Sorry, this course is now FULL; please email the course administrator if you’d like to be held as a reserve. This Flutes at the Barns course is open to adult players of all abilities, whether new to the courses or returning FATBers. International participants welcome, as ever. Course tutor Zoë Booth will be joined by Rachael Buxton, course accompanist, to welcome you to a very exclusive Flutes at the Barns course - strictly limited to just nine participants - in October 2019. After a tasty supper, course activities will begin with a short introductory group session. On Tuesday morning the full range of activities will commence, with up to five sessions each day featuring a varied programme including a 45-minute individual flute lesson with Zoë for every participant, a private half-hour rehearsal with Rachael Buxton (plus top-up rehearsal on the final day), group sessions including workshops on repertoire, technique, interpretation and ensemble playing, small ensemble playing (some with coaching), and the chance to perform in informal participant concerts and/or a masterclass. Zoë and Rachael will also perform in an exclusive tutor concert. The limited number of places on offer for this course allow for increased contact with the tutors throughout the duration of the course, including the longer time for individual lessons than on larger courses. On Thursday the musical activities will conclude with a friendly and supportive concert, where participants may choose to perform solos, ensemble pieces, in flute choir for the concert, or may simply enjoy supporting their fellow performers. Flutes at the Barns is delighted to host a visit from All Flutes Plus, a specialist flute shop based in Warren Street, London, who are friends of the courses and can provide the chance to browse music, accessories and to try headjoints and flutes of all sizes. Flutes at the Barns has always encouraged a friendly and supportive atmosphere in which participants of any ability level can improve and make music together without pressure. Those who do choose to take advantage of the solo and/or performing opportunities will be given every encouragement from their tutors and fellow course-goers. Participants are recommended to prepare solo material as the basis for their lesson and accompanist session, and may also bring up to three other pieces which could be performed in any of the participant concerts/masterclass, if they choose to do so. All other music will be provided, so please expect sight-reading at your level. If you play piccolo, alto or bass flute please do bring them, and you will get the chance to play them in the ensemble sessions. Breaks and mealtimes are often sociable events, with much like-minded musical talk, however there are also chances for some time alone during the course, whether to rest, practise or explore the local landscape. The course title of Flutes at the Barns suggests the history of the courses, formerly held in converted barns, but - in more recent years - often accommodated in large houses, halls and former inns. This course happily returns to its’ roots, being held at a complex of beautifully converted “barns” for Flutes at the Barns October 2019. As Hurdlow Grange, this venue is known by FATB participants and tutors, providing, as it does, a range of large musical spaces - in Applegarth Cottage and the eaves of Cruck’d Barn and Bats Belfry - as well as comfortable sociable spaces; for this exclusive course, accommodation has been arranged without Hurdlow Grange itself, using, instead, Cruck’d Barn, Applegarth Cottage, Amberleigh House, and Bats Belfry. Located remotely from any neighbours, and with picturesque walks beginning from the front door, Cruck’d Barn is a peaceful retreat in which to make music without interruption. Participants are each accommodated individually, and guests will enjoy the many quiet and comfortable private spaces in which to relax and/or practice; all have individual access to an unshared bathroom, with some featuring an ensuite. 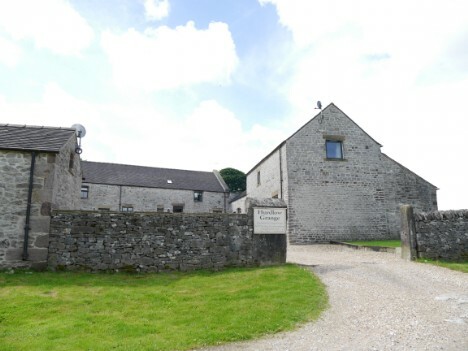 All the buildings have a unique charm and the character of the 200 year-old former farm-buildings they are, however recent renovations ensure that modern kitchen and bathroom facilities provide comfort and luxury. Meals can be taken together around one large table at the top of Bats Belfry, and the cosy living room spaces in the cottages create a pleasant atmosphere for all to chat with friends during down-time from musical activities. The main musical-making will take place in Cruck’d Barn in a large open plan room in the upper floor of the barn; masterclasses, many rehearsals and the first participant concerts are well suited to the similarly open-planned room at the top of Bat’s Belfry. Both are large spaces with wooden features and fittings, adding to an enjoyable and generous acoustic. Whilst on Flutes at the Barns allow yourself to be taken care of, with catering supplied by the talents of David Wakefield and his team of The Dinner Party Company. Daily breakfasts will include a range of options, including cooked items. To sustain your energy levels throughout the music-filled days, morning and afternoon breaks will offer snacks as well as hot drinks, with tasty buffet choices on offer for lunch. At the end of the day enjoy being served a delicious two-course evening meal (with a special celebration banquet on Thursday evening). Special diets are accommodated. Catering will start with supper on Monday evening (6.45 pm), finishing with breakfast on Friday morning, allowing for a leisurely end to the musical activities on Thursday evening, and a restful departure (avoiding rush hour) the following day. There is no bar; alcoholic drinks may be brought to the course for your own consumption, or to share with friends. £810 (£100 deposit payable upon application, balance due by Monday 26th August 2019). The course fee is inclusive of full-board residential participation, all meals and refreshments. Nearest airports: Manchester or East Midlands (both approximately 1 hour away). Nearest train stations: Buxton (approximately 15 mins away), Macclesfield (approximately 30 mins away) or Chesterfield (approximately 40 mins away). The course administrator will provide an opportunity for participants to share lifts on the pre-course questionnaire. Partners are welcome to accompany flute participants and share their accommodation at a reduced cost of £400, taking full part in all except the musical activities. (Partners are welcome to attend and support their playing partner in any performances during the course.) If making an application with a non-playing partner, please note that the total deposit is £150. If you have a particular physical need please speak to the course administrator before making your application, to ensure that the venue and activities can be happily suited to your requirements. 3. Approximately ten weeks before the course final details will be sent; at this point your final balance payment and pre-course questionnaire will be requested, to arrive no later than eight weeks before the course begins.